American rapper Wiz Khalifa has come out to reveal that fatherhood forced him to be more responsible and do things that he wouldn’t normally do. BASH [SEBASTIAN] IS A HUGE PART OF THAT TRANSITION – AND NOT BEING WITH HIS MOTHER, TOO, BECAUSE IT FORCED ME TO BE MORE RESPONSIBLE AND DO THE THINGS I WOULDN’T NORMALLY DO. THE OLDER THAT HE GETS, THE MORE INFLUENCE I HAVE ON HIM. SO IT’S NOT AS MUCH AS JUST MAKING SURE HE’S GOOD; IT’S ACTUALLY BEING THERE. The 31-year-old rapper – who co-parents the six-year-old Sebastian with his ex Amber Rose – loves being a dad and it has been a “huge part” of his transition as a person. SEBASTIAN’S MATURED HIM, BUT IT’S MADE HIM MORE SERIOUS AND UNDERSTAND, I HAVE TO BE HERE; I CAN’T DO THE DANGEROUS, RECKLESS THINGS I WAS DOING BEFORE: I HAVE THIS LITTLE GUY TO LOOK OUT FOR. 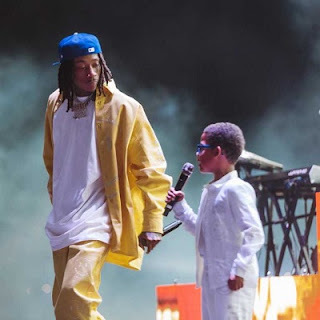 Performing this last weekend in Indio California, Wiz went on to share the stage with his young son on the Coachella stage. The father of one previously insisted that he will never speak ill of her baby mama Amber Rose. SHE’S BALD HEAD, SHE’S GOT MY KID, WE WAS MARRIED, YES, WE DID I STILL LOVE HER, SHE LOVES ME TOO YOU THINK I’ MA TALK BAD ABOUT HER, YOU’RE THROUGH I NEVER WILL, THAT’S THE MOTHER OF MY KID I’M RIGHT HERE, I’M DOING IT WITH BIG AND I AIN’T WORRIED ABOUT THESE H**S BECAUSE MY BABY MOTHER IS AMBER ROSE.